I’ve adapted that from our beloved Curmudgeon. Yesterday I washed fleece. Well, I washed some fleece. (If I’d written this post yesterday I would have titled it “Shut Up, I’m Rinsing Fleece.”) The weather is very humid this weekend. Today the damp fleece is distributed throughout my apartment to dry. I hope. I’m sure that there are apartment dwellers out there who buy and wash fleeces, and I’m curious what arrangements you’ve got for doing that? Do you use the bathtub and the single kitchen sink? Do you have old window frames tucked away somewhere that you lay over the furniture, to put the fleece on to dry? The Columbia is washing up nicely, I think. I also think I needed to pick it over better and open the tips of the locks before washing. I’m guessing that would get the tips cleaner and encourage more debris to fall out in the washing. Wouldn’t it? I am spinning. There is a triangular shawl in the planning; rather, there will be a triangular shawl in the planning when I get the yarn finished. The shawl will be vaguely Icelandic lacey, and to be honest, there are so many versions of what I have in mind out there already that I’m likely reinventing the wheel. But there are a couple of lace patterns that I want to use together, and there will be a little bit of further dyeing involved. Right now I’m ploughing through the singles. 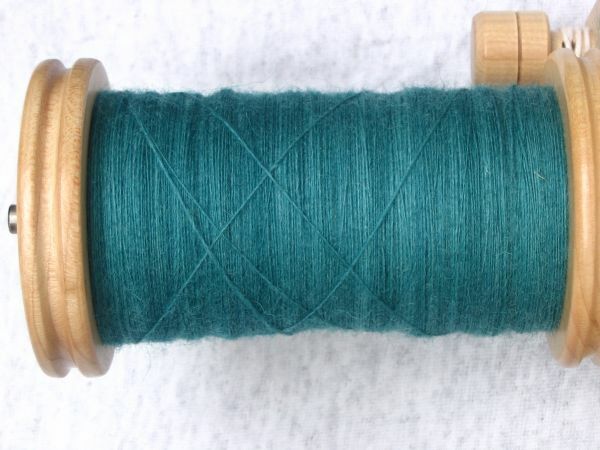 Fibre is 8-ish ounces of Falkland top (Louet) in colour teal. There should be lots of yarn left over from the project, and it might get given to somebody. There’s been a lot of teal spun this year, and after I finish this lot, I think I’ll spin purple. Or there may be a break from spinning, though, because I’m having low back, hip and neck pain after I spin for about a half hour. I think need some spinning lessons to change my technique. That or get a single treadle wheel. (Or both.) How people like Jenny, and Sara, and Abby, and June, and Dan produce the miles of yarn they do is a mystery to me. How anybody spins long draw or has a make of longer than 12 inches and not end up with pain is a mystery. The top, if anyone is interested, was dyed in the slow cooker. I weighed out the top, and calculated the amount of dyestock required for a 0.75% depth of shade. Since I really find working with solid colours boring, I wanted to dye the top somewhat unevenly, thinking that I’ll get a more interesting yarn when it’s all plied. Half the dye went into the pot with the fleece (and the required water for the dyeing process); the remaining half was injected in to the fibre at random locations. During the heating process the dyed further redistributed. The finished top is not as unevenly coloured as I wanted, but the changes are there: I think you can just see the variations in these pictures. I also think, though I’m not certain, that the dye broke in a few areas that are more blue. If so, it’s very subtle. Should make pretty yarn, at least. I broke the length of top into roughly 1 ounce lengths, and tore each length into 8 strips. One strip from each length went into a plastic bag (8 bags), and I’ve just been spinning my way through the bags. Speaking of Icelandic shawls, a couple of people have asked what I’m doing with Hyrna Herborgar. It’s gone to Barb at Wild Geese Fibres, for her to wear, use as a display piece when she’s out selling her wares, and so on. And I think it’s a good idea for yarn designers to see how their creation is performing and holding up in use. A little more on the Retreat. I admit I’m hesitant to say much, because I’m still looking at the costs. However, the date is set for September 28-30 – that’s Friday night to noon-ish on Sunday. This idea is get a group of fibreworkers together for sharing, learning, laughter, inspiration, help with a project, whatever, in a decent venue, and at a cost that won’t leave bank accounts groaning. No having to worry about planning / shopping for / cooking / cleaning up after meals. Knitters, spinners, crocheters, etc all welcome: I expect we may have a bobbin lacer in the group. I hope there’ll be a vendor’s market, and participants are welcome to bring fibre-related items for sale. (Chocolate counts as a fibre-related item.) If anyone wants to teach a short class on something, let me know. Two things I’m still looking for. One is a good name for the event. I’ve been calling it “Fibrefest North”, because that’s been easy for me, but there are other events called “Fibrefest”. (Well, “Fiberfest” actually.) So I’m looking for suggestions for names. I’m also looking for a designer to do a logo; Franklin has declined the job, citing overwork. If you know of anyone to do a simple logo, please contact me. There is a very similar messenger bag pattern at knitty.com. The same but different colors. 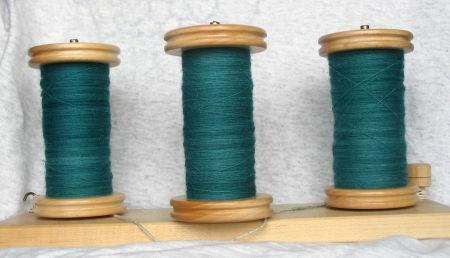 Your spinning is sublime, as is that teal color. Shut up, I'm spinning? Heh. "Shut up, I'm counting" was what my mother said to me as a child, and which I adopted when I became a mother myself. However, Ma said, "Be quiet", as she found "shut up" to be crass. I had no qualms about saying it to my kids. Because I'm crass. Sorry to submit another comment but I forgot to tell you. Get a copy of "Spinning for Softness and Speed" by Paula Simmons. Then you will be able to spin miles and miles of yarn with no pain at all. Available through Amazon. As usual, your spinning is gorgeous and inspiring! RETREAT!!! YES!!!! I've been to an informal fibrefest before, and they are FANTASTIC!!!!!!!!!!!!!!!!!! This is, hands down, my favorite color in the whole world! I had to resist putting periods between each word for emphasis- I'm amazed! So beautiful. For drying washed fleece - I made a simple portable unit using three 8 foot lengths of 1/2" plumbing pipe and 4 elbows for the frame. Cut one length in half - then put all together to make a 4 x 8 frame. I used cheap platic screening, with a pocket-rod edge, made from old blue jeans, sewn down the two long sides. Nothing is glued together - so it all pops apart and rolls up for easy storage. To use, assemble and straddle it between to tables or whatever that are slightly less than 8 feet apart. For 'speed drying' I put a table fan on the floor angled up to the bottom of the dryer. I used plastic plumbing pipe and it does sag a bit - I woud use copper if I made another one, for better rigidity. Your writing is lighthearted and fun. It is obvious that you speak of something you love. I admire your knitting for the ground up style. I hope to be doing the same thing one day. One simple children’s “learn how to knit kit” has turned into a passion for me. People like you and others in the group, provide me with inspiration and a peek into what can be done with a simple pair of sharpened sticks. The results are amazing and totally exciting. I am interested in the knit retreat and would like more info when you make it available. One question about crock-pot dying: Is it stinky? I am imagining wet dog smell. I got a great elevated mesh dog bed from Hearth & Home. The dog hated it and refused to lie on it, so I use it as a drying rack for sweaters, etc. It can be disassembled easily and stores in a corner of the hall closet. You can also buy sweater drying gizmos that will hang from a shower curtain rod. Some of those are multi-layered. In any case, however you dry fleece or anything else, it will dry much more quickly if you use a fan to blow air over or around it. This is particularly helpful if the air can get at both sides, but it works for things lying on surfaces, too. No heat, just air. I love that teal color. It's times like this when I consider taking up dyeing and spinning, instead of just knitting. I've gone so far as to buy a stainless steel pasta pot for a dye pot, as well as a little undyed yarn, but haven't gotten beyond reading net tutorials. I like the idea of using food color, though. I'm very hesitant to tackle a raw fleece, so I will be curious to see if and when you do, how it goes. Color and spinning on that yarn is amazing... beautiful, really. 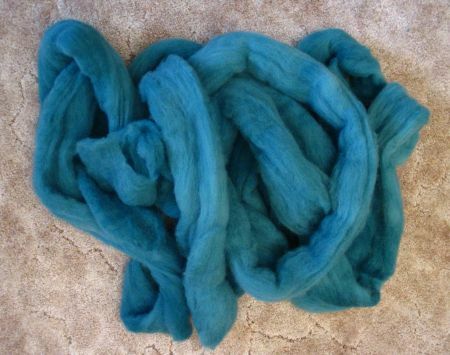 I always like how the color becomes more saturated as the fiber is spun. Fiber Clan? Fiber Quest? Fiber Assylum? I love the teal singles and I think the subtle shades will serve you well when you go to knit with it! Fiber Fest OS for Owen Sound? Fiber Fest Canada? Fiber Fest Not Toronto? Just get the damn thing set up already! Catlady and I are ready to mischief. those teal singles are divine.